Based upon the intent of the Founding Donors, the Foundation aspires for the people of Clark and Cowlitz Counties to be educated, healthy and to value and preserve the lessons of the past. To improve education, health and historic preservation in Clark and Cowlitz County by recognizing unfulfilled needs and funding projects that make a difference. Arlene Goheen Price was born in Vancouver Washington and lived all of her childhood years on the family property purchased by the Falk family in 1906. She graduated from Vancouver high school and after working at the shipyards during WWII she graduated from Washington State University in 1947. 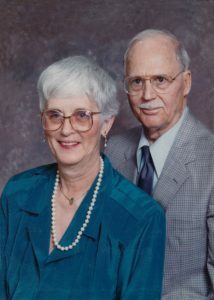 She met her husband Frank while teaching art at Huntington Junior High School in Kelso, Washington. They were married for 43 years before his death in 1996. Frank was born in Oklahoma and served in the Navy in the early 1930s as a seaman and an officer after graduating from college at Oklahoma A&M during WWII. He came to Cowlitz County in 1952 and after finishing law school at the University of Washington he practiced as an attorney and later retired as a superior Court Judge. While working and residing in Cowlitz County he ran the Navy Reserve there and retired as a Navy Captain. Though never blessed with children they felt a great connection to the Cowlitz and Clark County areas. They loved to travel and spent much time on their tree farm in Rose Valley Washington. It is their wish that their estate benefit the people of Clark and Cowlitz Washington Counties and have established a trust to provide for the health, education and historical preservation therein.